As the media landscape shifts, so too have newsroom resources. One looming question is where people can find coverage of local news subjects, particularly government and public affairs. A new comprehensive and highly anticipated university study of local news from communities across the country offers a piece of the answer. The study of 98 major metropolitan cities and 77 suburban communities found that the medium significantly affects how and what local news gets covered–particularly about government. The study funded by the National Science Foundation is one of the broadest based we have seen tackling the question of where government coverage comes from. Consumers have a wide, growing variety of choices of media today. But the majority of news about local government still comes from newspapers, according to the study by Thomas Baldwin, Daniel Bergan, Frederick G. Fico, Stephen Lacy, and Steven S. Wildman, a team of Michigan State University researchers associated with The Quello Center for Telecommunication Management and Law. And that is even truer in suburban cities than in larger central metro cities. In suburbs, moreover, most of the news people get about local government comes from weekly papers, not dailies. 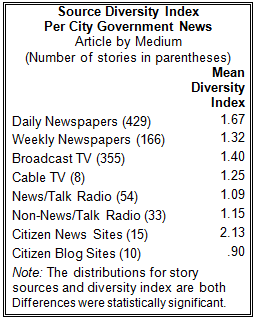 The medium also made a difference in the level of sourcing and in the diversity of sources offered in news stories. Citizen news sites, while so limited in number that the sample is quite small, had the richest level of sourcing studied and the widest range of types of sources. Daily newspapers came next followed by weekly papers. 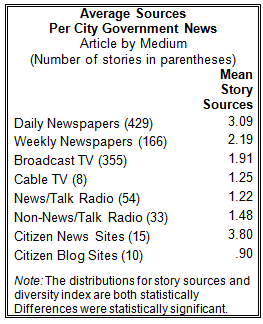 Citizen blogs had the lowest level of sourcing of any media studied. These are some of the findings of “News Media Coverage of City Governments in 2009,” which analyzed local news from 389 news outlets serving the 98 central cites and 77 suburban communities from around the country for two days between February 1 and May 2, 2009. The sample drew 6,811 stories and opinion pieces (6,042 from the cities and 769 from the suburbs). The sample included daily and weekly newspapers, broadcast television, cable television news/talk radio, non-news radio, citizen or community news sites, and local citizen blogs. Newspapers were much more likely to cover government than any other news medium. In big cities, for instance, 53% of the government news stories studied appeared in newspapers. About another third, 36%, appeared on broadcast TV news. Only 5% came on news/talk radio, 2% on citizen news sites and 1% on blogs. The differences in what different media covered were even more pronounced in suburban communities than in central cities. In the suburbs, 75% of stories related to government came from newspapers, and more of these in the suburbs came from weeklies. In all, indeed, 41.3% of these stories appeared in weeklies and 33.6% in daily papers. The rest of the coverage of suburban government coverage was more scattered. Another 18% of suburban government stories appeared on television and 1% on community news sites. The sourcing of news varied noticeably by platform. While the sample is small, perhaps because such sites are only now emerging, citizen/community news sites had the richest sourcing of all the media studied. The15 city government news stories found on the news sites in those 176 communities averaged 3.80 sources per story. Daily newspapers came next in the number of sources cited, with 3.09 sources per story, and weekly papers at 2.19. Blogs ranked last, at 0.90. The ranking by diversity of sources, meaning the average number of different types of sources in a story, was similar though not identical. Citizen news sites had the highest ranges (2.13) followed by daily papers 1.67, but here broadcast television came out ahead of weekly papers (1.40 vs. 1.32). Each medium had a different top focus. Newspapers focused more than any other topic on local government. Fully 27% of newspaper stories studied focused on government, particularly city government. Television was more focused on crime; 32% of its stories dealt with crimes or courts. The distribution of stories for radio was similar to television (29%). The No. 1 topic on citizen/community news sites, by contrast was human interest (27%). The volume of local coverage varied widely by medium as well, largely because the number of outlets in each medium varied. Over the two days studied, the 114 newspapers serving the target communities produced the largest number of local news stories (429). This number does not include opinion pieces. There were 152 local television and cable stations, which produced 363 stories. There were 50 weeklies, which produced 166 stories. And 19 citizen news sites, which produced 25 stories. The 54 radio stations that produced local content produced 87 stories. In short, the study describes a complex media ecosystem, in which media are not so much duplicative of each other as perhaps complementary. While major stories are likely to appear in many places, much of the day-to-day coverage of government can be found in one medium more than anywhere else, newspapers. Public safety news, such as crimes, accidents and disasters, are a specialty of television and radio, along with weather and traffic. The emerging citizen media may well form their own sense of purpose and specialty. The study, which covered only a short period of time, two selected days, cannot establish what that might be. But with such a breadth of communities involved, the study can establish that the medium does, at least in terms of topic, influence the message. “News Media Coverage of City Governments in 2009” is based on analysis of local news from 389 news outlets serving the 98 central cites and 77 suburban communities from around the country for two days between February 1 and May 2, 2009. The sample drew 6,811 stories and opinion pieces (6,042 from the cities and 769 from the suburbs). The sample included daily and weekly newspapers, broadcast television, cable television news/talk radio, non-news radio, citizen or community news sites, and local citizen blogs. One caveat here is that the data are now a year old, though the study is being released now. Some new media may have evolved since then. The study examined two days of news and opinion from the day before and the day of a regularly scheduled city council meeting. Selecting these days increased the likelihood that stories would be published about city councils by the various news outlets. The particular city council meeting dates for the cities were randomly selected. The content from the television and radio stations and the citizen journalism sites were downloaded from the Web because of the difficulty of obtaining recordings from 206 stations, and the web is where citizen journalism sites publish. The newspaper content was taken in most cases from the print editions because that is where the majority of local readers still obtain their information. The websites of newspapers might contain some additional content, and the inclusion of that content from the Web might have established the dominance of newspapers to a greater degree, the researchers believe. Still, the fortunes of those new platforms associated with legacy media are hardly immune from whatever happens to the original platform.